For info on Colour, Cable & Laser Etching options, see the 'Optional Extras' tab below. NEW for 2017! Our redesigned cable and mounting system ensures excellent durability and gives the Evolve a great new look. Combining the latest ACS technologies and the new detachable cable system the Evolve delivers a truly reference quality, high fidelity IEM. 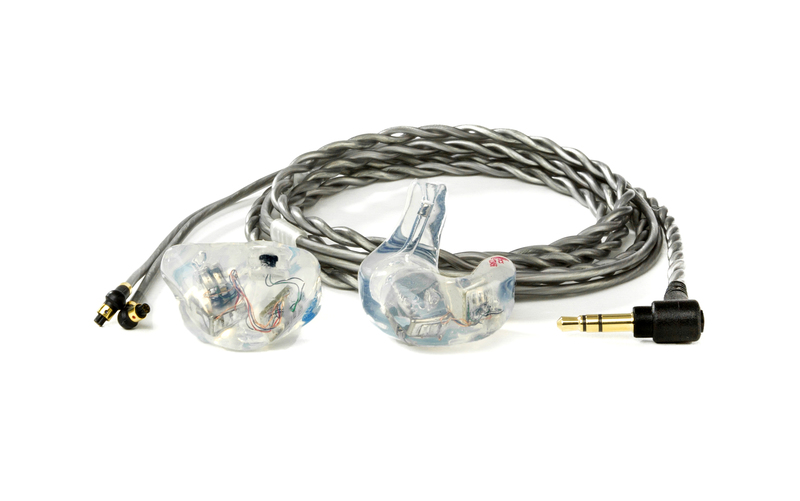 If you are looking for a well-balanced, detailed and accurate sounding IEM without breaking the bank then the Evolve is the one for you. Download the ACS Evolve Custom specification sheet. Have your name or other text lasered on to each side (Up to 10 characters including spaces). Custom IEM's are made in clear silicone as standard, or you can choose an optional colour from the chart below. NB: The colours shown in the chart have been reproduced as accurately as possible, but may differ from the actual product due to differences in screen resolutions. Click image to enlarge or Download as a PDF. Never use the cables to remove the IEMs - this will eventually put strain on the connector and will damage the cable. Ensure moisture from either humidity or sweat is removed straight after use. We supply silica gel and a zip up pouch for this purpose. We recommend using your Revivo dehumidifier after each use.